Sonos’s PLAYBAR music system requires an accompanying smartphone or tablet and a little bit of practice, but as a way of bringing together all your music sources *and* replacing your TV’s speakers, it’s without equal. It’s not the best soundbar we’ve heard, but it’s close -- and Sonos’s trademark versatility makes this a very appealing product, if you can afford the asking price. Sonos’s wireless home music systems have always been deserving of a place in your living room, bedroom, or study — every one of the company’s Wi-Fi speakers, from the compact PLAY:3 to the larger PLAY:5 and SUB, is the best in its class when it comes to playing all the different kinds of music you own — whether it’s stored on your PC, on your laptop or smartphone, or whether it’s a streaming subscription or Internet radio. Sonos has never really had a proper solution for using its speakers with your TV, though. You could use a PLAY:5 or PLAY:3 system and a line-in cable, but it was a complicated process and didn’t always work perfectly. Enter the PLAYBAR: Sonos’s latest speaker system, and one that promises to connect your TV and Blu-ray player just as easily as it does your iPhone and iTunes library. The PLAYBAR is a very well-built speaker. 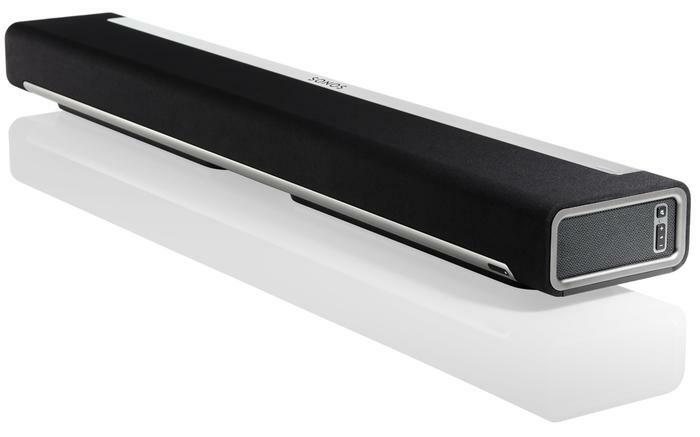 Aluminium and thick plastic make up the soundbar’s internal framework, with a strip of exposed metal and a long grille of smooth fabric wrapping around the outside. At one end of the PLAYBAR you’ll find a mute button and volume control. There’s no power button; the PLAYBAR goes into a low-power hibernation when there’s no audio playing, but it’ll start up again in a moment’s notice whenever you turn your TV on or start playing music through a Sonos Controller app. Setting the PLAYBAR up is a trouble-free process. There are only three connectors of any importance on this speaker, hidden on the rear in a small cavity — you’ll see a figure-eight power socket, two Ethernet network ports, and an optical digital audio input. The last one of these is the most exciting — it means you’re able to connect the PLAYBAR directly to your TV, so the speaker can play audio in sync with what you’re seeing on the screen. If you’ve got any LCD or plasma TV made within the last decade, it’s likely that it will have one of these optical digital audio outputs and will be compatible with the PLAYBAR. Looking at the Sonos PLAYBAR front-on, once it's wall-mounted. The Sonos PLAYBAR also has infrared receivers built in, set up to receive volume and mute commands from your TV’s remote control. This means that if you’re just watching TV or movies, you don’t need your smartphone and Sonos Controller app with you — you can use your TV’s remote and adjust the volume just like you would normally. 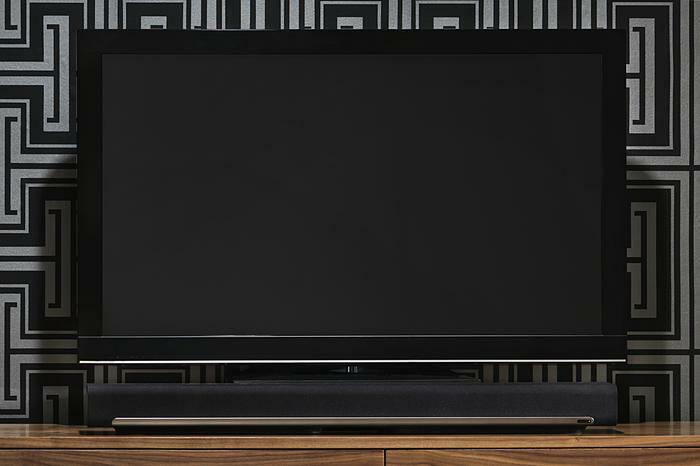 The PLAYBAR is designed to be used below your TV, sitting underneath it on your TV cabinet. If you’ve got a wall-mounted TV, the PLAYBAR can be mounted below it using an optional kit. In either configuration, the speaker’s integrated sensors detect its orientation and adjust accordingly. 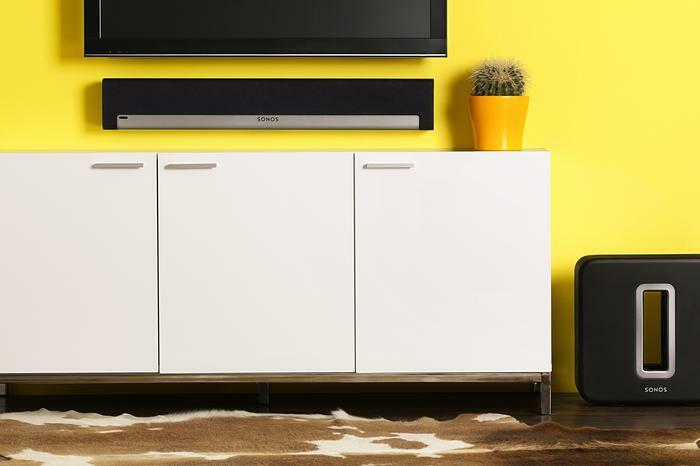 Because the PLAYBAR’s speakers are positioned facing diagonally — there’s nine of them, by the way — they are equally at home whether the soundbar is placed flat or wall-mounted. An exploded look at the nine speakers, in three channels, inside the PLAYBAR. Wherever you’ve got the Sonos PLAYBAR set up near your TV, you can use it wired — through the Ethernet port, connecting to your home network — or wirelessly — through the PLAYBAR’s integrated SonosNet Wi-Fi network. If you want to use Wi-Fi, you’ll have to have a Sonos BRIDGE or another Sonos component physically connected to your router with a network cable. If you have any other Sonos products, adding the PLAYBAR to your home music setup is a breeze. If the PLAYBAR is your first Sonos speaker, there’s a comprehensive quick start guide included in the box that runs you through the process. If you’ve got it plugged in correctly, and you have a mobile device handy to run the Sonos Controller app, you’ll have it set up in a couple of minutes. We tested the PLAYBAR playing music on its own, with a SUB, and with a SUB and two PLAY:3s. Our audio sources ranged from free-to-air digital TV, to locally-stored FLAC and MP3 and AAC files, to streaming services Rdio, Spotify and Pandora. The entire Sonos family of speakers and devices. Of course, being a Sonos system, you’re able to access and play all these sources through Sonos’s Controller app — available for Android, iOS, PC and Mac. This means that having a complementary device — we used our everyday Google Nexus 4 connected to our home Wi-Fi network to control the PLAYBAR, streaming off ADSL2+ broadband. The Controller app is the heart of the Sonos ecosystem, and it makes the PLAYBAR and any other Sonos speaker easy to use. There’s a quick ‘TV’ toggle in the Controller app to switch the PLAYBAR to pick up the audio coming out of your TV, but if you choose to play a music track from your library or off a streaming service the TV audio is muted and replaced with whatever you’ve chosen. It’s a simple and user-friendly process that isn’t too daunting, and it becomes easier with a bit of hands-on practice. The Sonos PLAYBAR under a TV -- the simplest setup possible. One of the most exciting aspects of the PLAYBAR is the versatility that’s possible with its setup. At its most basic, to use the PLAYBAR, all you need is the speaker and a TV. Plug it in, set it up, and you’re ready to go, with the PLAYBAR’s three-channel audio sounding a hell of a lot clearer and more pleasant than any TV speaker we’ve heard before. But if you want to get more complicated, Sonos is happy to help you out. You can pair the PLAYBAR with a SUB, for a huge bass kick that makes for the best-sounding compact audio system we’ve heard for movies or music. If you’re really keen, you can add in a couple of PLAY:3 speakers at the back of the room as rear surrounds, giving you a complete 5.1-channel surround sound system for your DVD or Blu-ray movies. All of this drives the price up significantly, of course, but it’s possible and is impressively easy and hands-free to set up. Even on its own, the PLAYBAR sounds great. 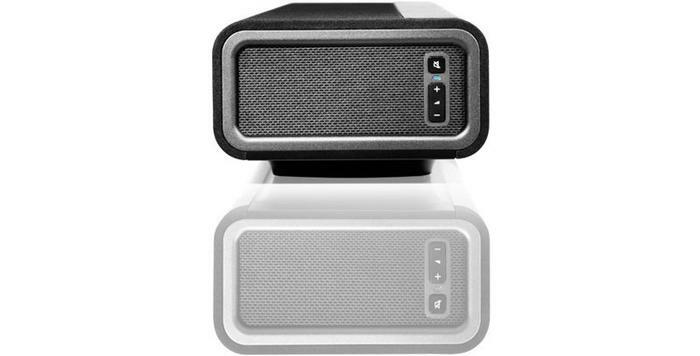 It’s not as punchy as the PLAY:5 speaker in its bass and mid-range power, but it’s got a well-rounded sound that’s exceptionally clear, with a solid mid-bass accompaniment that makes for generally room-filling audio. The Sonos PLAYBAR with accompanying SUB for low-frequency effects. The three-channel setup within the PLAYBAR’s body — left stereo, right stereo, and a centre channel — is simulated from stereo audio with dialogue or music vocals being channeled to the centre speaker, so in general you’ll find voices slightly more pronounced than with a normal stereo setup. It sounds great for a soundbar, which are generally mediocre. Add the SUB into play, and the PLAYBAR changes completely. With the SUB taking care of more than its fair share of low-range frequencies, the PLAYBAR is able to concentrate more on mid-range and treble frequencies and sound is both richer and clearer as a result. We’re fully aware that this is a $2000 setup for just two speakers, but we think it’s the best compact simulated-surround speaker system on the market. Adding the two PLAY:3 rear surround speakers is another level of immersion again, and unlike a home-theatre-in-a-box 5.1-channel system the Sonos setup is excellent for both movies and music. The rear speakers are more for a bit of fill-in effect with movies and TV viewing, but switch on some high quality music tracks and they work wonderfully. The PLAYBAR sans speaker grille and outer shell. Our main gripe with the Sonos PLAYBAR is the lack of surround-sound customisation available for the soundbar’s audio output. Any Sonos speaker in your setup can have its bass, treble and loudness adjusted, but there’s no way to alter the ‘wideness’ of the PLAYBAR’s sound. Where other soundbars have settings to toggle faux-surround digital signal processing, you can’t change the PLAYBAR to be more or less surround-y — you can’t boost or lower the volume of dialogue, for example. If you’ve got only the PLAYBAR under your TV, this isn’t really an issue, but with extra speakers added to the system we would have liked a little bit of extra control. Sonos’s PLAYBAR wireless soundbar is another interesting product to come out of the Californian company. It’s easy to set up, remarkably versatile and modular, and sounds great no matter the configuration you have it set up in. The side-mounted volume and mute controls on the PLAYBAR. We do wish the PLAYBAR had a little more audio adjustment available — a direct stereo mode would have been nice, maybe alongside a variety of surround sound effects — and the price tag is definitely competing with serious home theatre setups. At the end of the day, though, we’re just happy that we’ve finally got a Sonos speaker that can do TV and movies just as well as music.